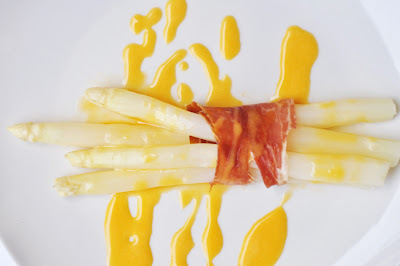 As far as I know, no other vegetable than white asparagus is only available at its harvest season in Germany. The season starts at beginning or mid April. And there is a particular day when you'll have the last chance to buy it fresh and local. This year's cut off date is 24 June. As with white asparagus in the shops or on markets, I don't recall it ever being from somewhere else than Germany. Asparagus is being celebrated during those spring months. It's being side dished with bread crumbs in browned butter to almost everything. Or eaten plain with Sauce Hollandaise and a few slices of ham. In my early 20s, I used to work for a photographer's cooperative. Every year in May we all got together on a weekend, and prepared, cooked and ate asparagus with ham and Sauce Hollandaise until we dropped. I dedicate this post to OSTKREUZ, in memory of old times. Now some of you might be aware that I am German, but have been living in Dubai for several years. Shall I tell you where I this white asparagus was from? It's an environmental disaster, but I couldn't help it: Peru. With regards to veggies and fruit in season, we live in a sort of no-man's-land here in Dubai, as we are surrounded by desert, very little rain in winter and scorching heat with no rain in summer. Every now and then, I indulge in something imported from very far away......and enjoy every bite if it as I get melancholic about the foods that I grew up with back home. Peel the asparagus and cut off dry or wooden ends. Put into a pot with cold, slightly salted water and bring to boil. Cook for about 20 minutes or until asparagus is tender. Make sure not to overcook. Drain. While the asparagus is cooking, make the Sauce Hollandaise. Vigorously whisk the egg yolks and lemon juice together in a stainless steel bowl and until the mixture is thickened and doubled in volume. Place the bowl over a saucepan containing barely simmering water (or use a double boiler,) the water should not touch the bottom of the bowl. Continue to whisk rapidly. Be careful not to let the eggs get too hot or they will scramble. Slowly drizzle in the melted butter and continue to whisk until the sauce is thickened and doubled in volume. Remove from heat, whisk in cayenne and salt. If the sauce gets too thick, whisk in a few drops of warm water before serving. Transfer asparagus to plates. Wrap 3-4 spears in a slice of Serrano or Parma ham. Drizzle Sauce Hollandaise over it. Serve with boiled new or oven roasted potatoes.